I like this movie. There, I’ve said it. It’s not a particularly popular choice, as it turns out, with a fair amount of people. 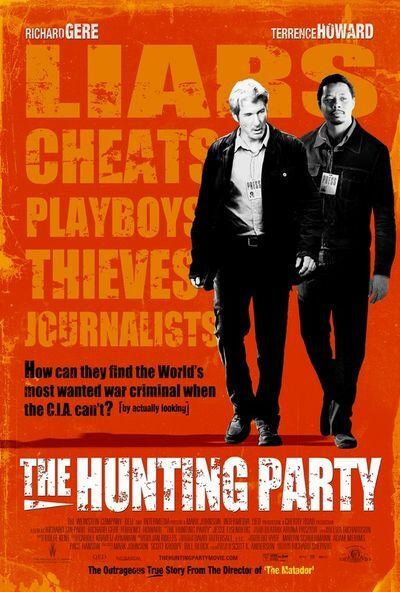 Reviews of ‘The Hunting Party’ have knocked it whenever possible, while the majority of the American audience has generally given it the damning ‘thumbs down’ verdict by not attending. As a result, it made back only the same amount of money that Brad Pitt would probably earn just by breathing air around a product, rather than cover the relatively mammoth production budget of over $20 million. I also like the fact that the filmmakers chose a brave subject to explore. There’s not that many films that tackles issues that happens in countries like the Balkans. Generally speaking, people have forgotten the issues that happened there. If one is to consider the attention that is given by way of making movies about such subjects, then things like ethnic-cleansing no longer grabs ones attentions as much as the Iraq war, Afghanistan, even Guantanamo Bay. For that, it’s effort in refocusing the focus on something that was over a decade ago deserves much plaudit. Not that it is a straighforward, doom-and-gloom account. In fact, ‘The Hunting Party’ is quite funny, owing much to the comedic timing and combination of both Richard Gere and Terence Howard. Gere portrays Simon Hunt, a former ace journalist whose one moment of madness ruined his broadcasting career, casting him to the scrap pile to report for Polish national TV (and the like). The gap, however, gives the opportunity for his cameraman, Duck (Howard) to come in and grab it with both hands. Having spent many years together as a reporting team, Simon’s breakdown saddened Duck, as they lost touch for many years. Fate would have it, then, that they would be reunited many years later. Duck, along with Franklin Harris (James Brolin) and Benjamin Strauss (Jesse Eisenberg), the son of the Network’s Vice-President, have landed in Bosnia during the fall of 2000, 5 years after the Bosnian war. Upon the not-so-chance meeting (certainly not on Simon’s part), Simon tries hard to convince Duck of the possibility of hunting down the most wanted war criminal not yet caught, Boghdanovic ‘The Fox’ (Ljubomir Kerekes). With Benjamin also keen to tag along for the experience, and also to prove himself, the three of them set off on a wild goose chase through the Balkan mountains. Before going any further, I have to admit to have metaphorically put down some money on the bad guy being portrayed by Jonathan Pryce. Look at him; he’s a spitting image of Jonathan, and there’s a perfect casting opportunity here for a future ‘brothers’ movie starring the two of them. Having said that, any movie can’t live on the actors alone, for it relies heavily on the concept and the execution of that concept as well. It leads nicely to the next point. Despite rooting it in the basic realities of our time, the director, Richard Shepard, took a fair amount of creative license in what was already a creatively-licensed endeavour. Not unlike ‘American Gangster’, the film is based on an article by a journalist named Scott Anderson, who basically noted down the happenings on his holiday to Sarajevo. 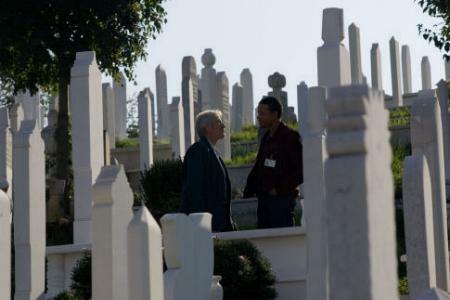 Bumping into his other journalist friends, they decided to go look for Radovan Karadzic, an accused war criminal. Though it starts out as a bit of a laugh, their own adventure took a turn for the worse when the worrying reality of international protection of war criminal rears its ugly head. The film, then, should be considered as distant a cousin from the article as possible. Though based on a similar journey structure, as well as similar plot twists, the execution has changed. These details are minor (from five to three characters, from man to woman), but there are enough of them that looking for the article online would be a whole other experience on its own. That’s not to say that the film is bad. I am a big fan of creative license, and in this case, that license is well used. Rather than making a film that preaches about the horrors of war (as is the wont for similar movies of this ilk), the director infuses plenty of humour into the proceedings. If he is brave for tackling the subject matter at hand, he is even braver for turning the tone of the situations upside down. It is not a perfect movie, however. There are moments when some of the jokes feel a bit flat. Simon, for example, is portrayed as a man who has no money (part of the reason why he’s after The Fox, who has a $5 million bounty on his head). Though I do think that it adds something to the character, at times, his desperation for money makes me feel pity for him (which I don’t think is a good emotion for the lead character to evoke, unless the story calls for it). This is, however, a personal taste, and one which you may not mind so much. Having said that, all the personal tastes do add up to one big public serving, one which has not been well received. It is unfortunate, for I’ve seen movies that are far worse garner more critical acclaim and more money from its audience. Perhaps there is some backlash against Terence Howard (good though he is, he’s been a part of almost twenty film and TV productions since his breakthrough in ‘Crash’). Perhaps Richard Gere is simply too dashing and charming to play a journalist who’s down on his luck (though the chemistry between the two is really good). Perhaps it’s just bad timing. Or, perhaps like the Balkan war itself (and its aftermath), no one really cares.